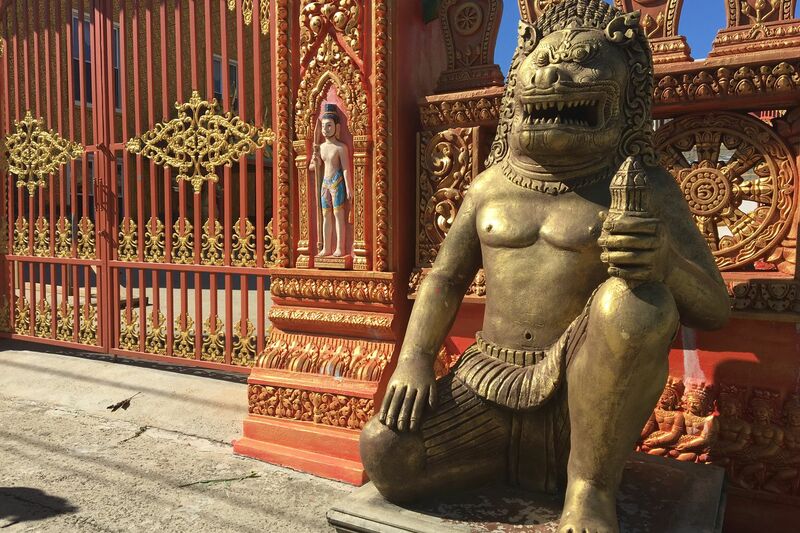 The entry gate of Preah Buddha Rangsey, a Theravada Buddhist temple in South Philadelphia. The red-brick apartments on South Sixth Street squat side by side, braced against the wind and snow. An overturned blue armchair, missing two wooden legs, has crashed against a metal grate. A windblown plastic bag sends two sparrows flitting to the curb. But one step through the door of the red-and-gold temple on the corner of this South Philadelphia block, and all is instantly quiet. ‘They welcome people.’ Inside a Buddhist temple in Bucks County. A sign at the top of the stairs reads: “Take Off Your Shoes.” A golden shrine, covered with lilies and purple orchids, holds a white stone statue of the Buddha. Low tables and cushions line the wall. A barefoot monk named Muni Rath pads across brightly colored woven mats that cover the tiled floor. The space at Sixth and Ritner Streets may seem surprising. But for many people, it’s home. As migrant populations in Philly have increased, so have linguistic and cultural differences, and some of the city’s newest East and Southeast Asian residents are struggling to find places where they feel safe, supported, and included in community life. Their desire for the familiar has them turning to religious spaces. One class at Pennsylvania State Abington is attempting to log these spaces, and to document the many forms of American Buddhism seen around Philadelphia. The class is called Buddhism in the West; it’s a religious studies course taught by Pierce Salguero, who specializes in the study of Buddhism and healing practice. The course requires its students to visit each site, interview community members, and record their perspectives. Salguero and his students have been developing an online archive called the Jivaka Project, which charts almost 50 Buddhist temples and community centers around Philadelphia. He says it’s the first project of its kind. Main building and exterior wall of Preah Buddha Rangsey, Theravada Buddhist temple in South Philly. Some of the places surveyed are traditional temples like Preah Buddha Rangsey, Rath’s South Philly home. It opened more than 15 years ago and now holds services for up to 100 community members at a time. Sixty percent to 70 percent of those members are Vietnamese, Chinese, Cambodian, or Laotian immigrants — so the temple, staffed by five monks, provides services like legal aid, document translation, and interpretation. Exterior of the Buddhist Tzu Chi Foundation in Philadelphia's Chinatown. The Jivaka Project also catalogs nonprofit offices with Buddhist roots, like the Buddhist Tzu-Chi Foundation, which organizes community events and disaster relief. Although its founder is a Buddhist nun, the staffer on duty at its Philadelphia Service Center — Sister Sueling Wang — emphasizes that the center does not press religion onto its members or visitors. Instead, Wang says, the core value of compassion drives the center’s initiatives, which include a soup kitchen, weekly English classes, and tax assistance in Chinese and English. And while Tzu-Chi is located in Chinatown, its outreach includes communities beyond the neighborhood. Still other organizations surveyed by Salguero’s students provide Buddhism-based healing and community in concert with Western practices. In Glenside, the Won Buddhist Temple meets in a revamped Protestant church; there are two services, one in Korean and one in English, with a similarly bicultural audience. The integration of these communities has taken time. According to the Jivaka Project, the community center in the temple basement was started to support the Asian immigrant population in the suburbs. But as it grew, and as immigration patterns in Philly began to shift, it expanded to serve populations from Africa, Latin America, Eastern Europe, and other parts of the world. These locations offer comfort, care, and understanding for migrant Philadelphians, many of whom have fled pain and trauma in their heritage countries or who find themselves dealing with unexpected catastrophe in the United States. One such woman is at the South Philly temple on this day. Her sister-in-law and nieces recently died in a house fire, and her grief is palpable. But over the course of an hour, as the temple staffers remind her of their support and offer help with funeral processes, she begins to seem hopeful. Now, she and her companions look out the window and gasp at the storm outside. Speaking in rapid Khmer, the Cambodian language, they button their jackets and wrap themselves in scarves, wave farewell to Rath, and exit the temple. One, a young man, hesitates just before the doorway and turns back to the monk.